In case you missed my previous post Fresh Basil Topped Slow Roasted Tomatoes I’ll mention again that I love tomatoes. Especially locally grown, British tomatoes that are ripened on the vine and left on the worktop, not in the fridge. Sweet and savoury bursts of Summer on my tongue. Here I have baked them into a layered quiche with fresh basil and two types of cheese. 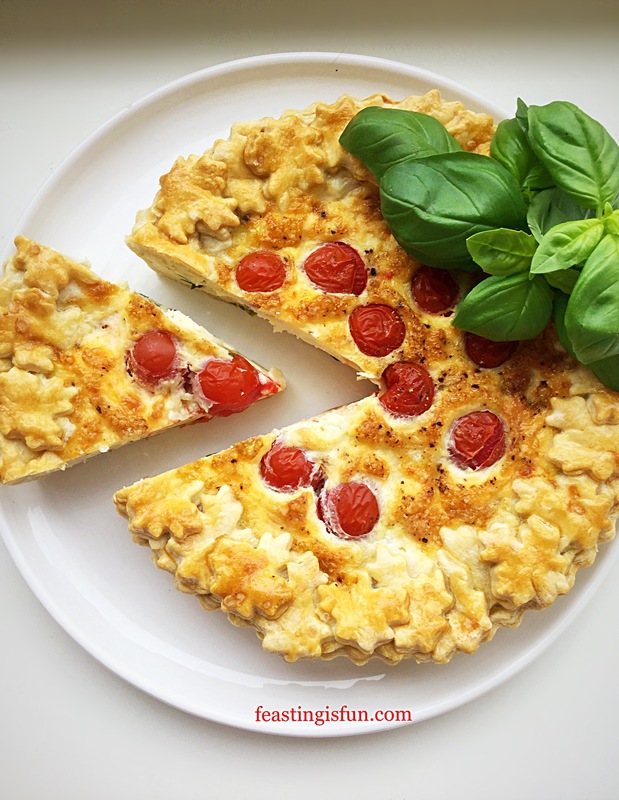 So I am thrilled to bring you my Cherry Tomato Mozzarella Basil Quiche. 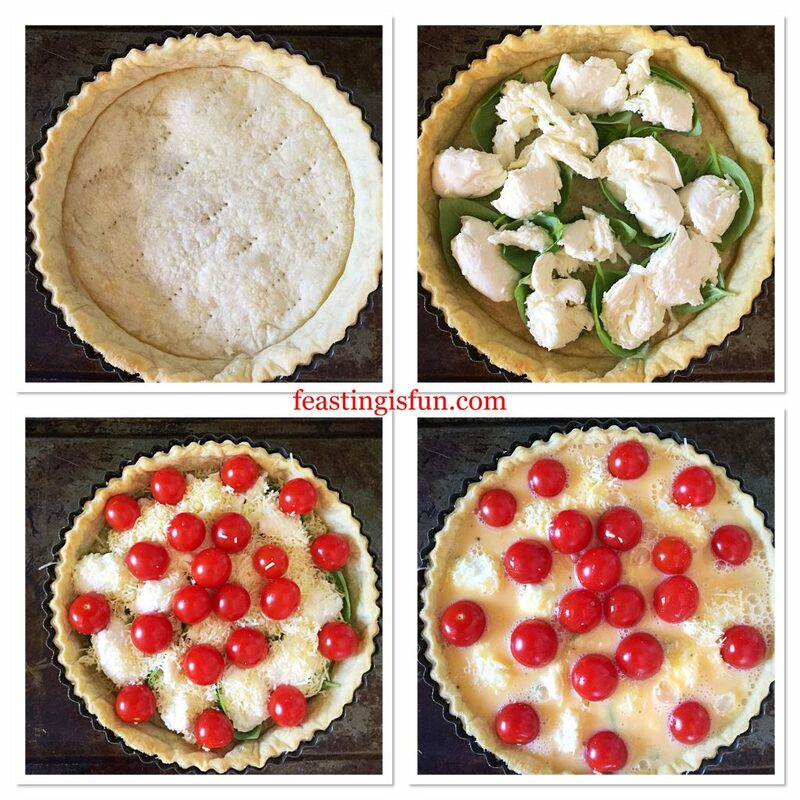 I was inspired by the classic caprese salad of fresh tomatoes, mozzarella cheese and fragrant basil to make this savoury tart. Since each element compliments the others so well as a salad the same can be said of this quiche. Also, layering the separate ingredients within an all butter pastry tart creates a delicious dish. Perfect for lunch, dinner, picnics, packed lunches and buffets. And that is how delicious this quiche is! 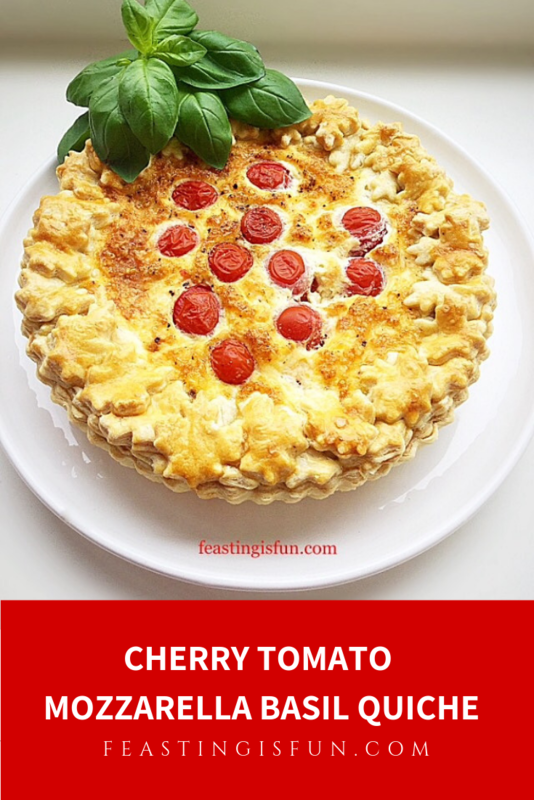 Because using local, seasonal produce is important to me, as a home cook and Food Blogger, I was delighted when I was offered a box of Sophie Jane cherry tomatoes. Locally grown by Eric Wall a local, specialist grower. The tomatoes I received are ripened on the vine and are grown without the use of pesticides. Most importantly they taste incredible. In fact just like a tomato should taste. Eaten warmed by the sun, after being left on the windowsill, they are sweet with a deeper savoury flavour. Also they weren’t very acidic as some tomatoes can be, especially tinned ones. While British Tomato Fortnight has finished I firmly believe that we should all be eating flavoursome British tomatoes for as long as they are available. Because they taste so good. It really is as simple as that. I have been popping these ruby beauties into my mouth like sweeties. Eating them alongside crackers and cheese and I plan to make more recipes to share with you. All in aid of celebrating the humble tomato. 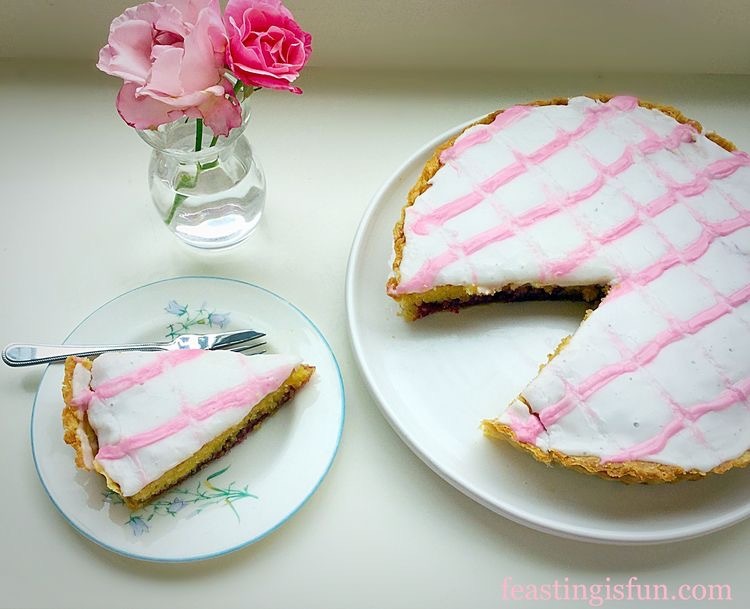 You will need a 20cm x 5cm (8” x 2”) tart tin, ideally with a loose bottom, to make this recipe. 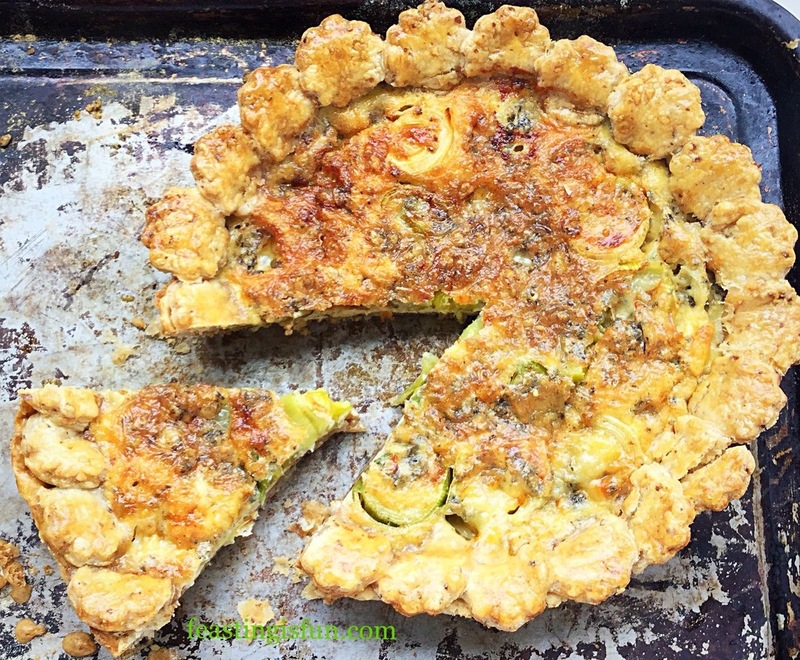 A quick note – I successfully doubled all of the quantities and made this quiche in a deeper, wider dish. Baking times need to be adjusted, aside from the initial blind baking. 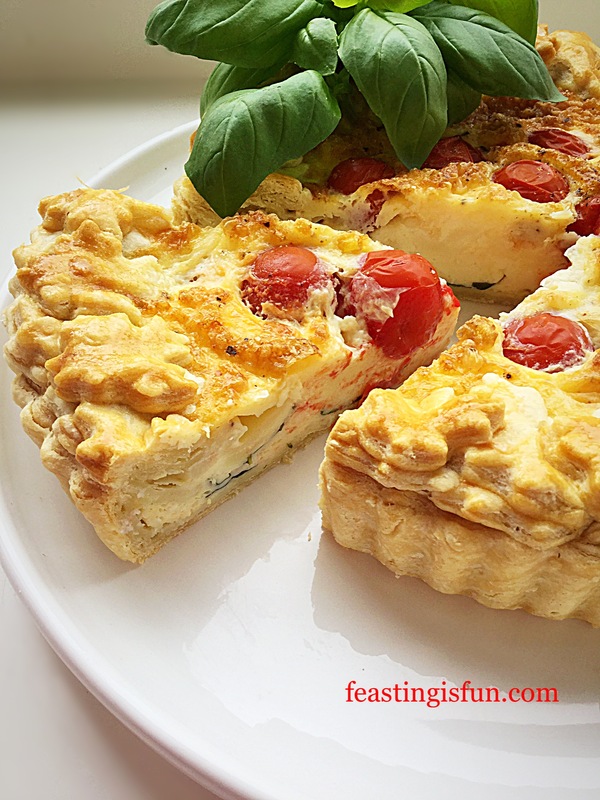 The larger quiche turned out perfectly and would be ideal for feeding a crowd, or a buffet. First of all make the pastry, wrap in cling film and chill for one hour. 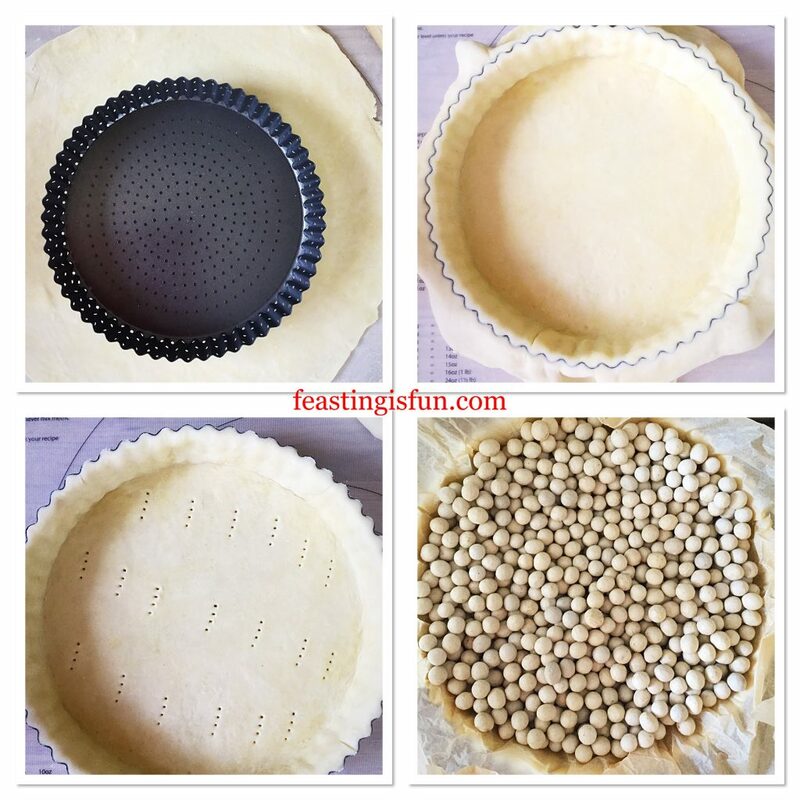 Remove the chilled pastry from the fridge, unwrap and roll out on a lightly floured surface, so that it will fit the tart tin. See photo top left below. Fold the pastry over the rolling pin, making it easier to transfer. Lower the pastry into the tin, making sure that you don’t stretch it as you do. Press the pastry into the tin so that it fits securely. Run your rolling pin over the tart tin, this will give a clean edge to the pastry. 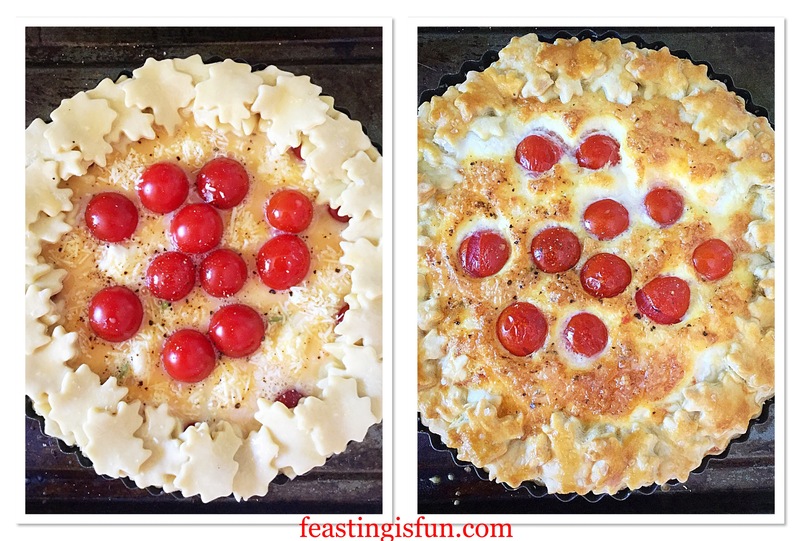 Place the tart tin on to a baking sheet and dock the base with a fork. Now scrunch up some baking parchment and line the pastry tart with it. Next fill with baking beans. Making the pastry shell for the quiche. Place in the centre of a preheated oven and bake for 15 minutes. Carefully lift out the baking parchment and baking beans. Return the tart to the oven for 5 minutes further baking. Remove the tart and reduce the oven temperature to 190C/170C fan, 375F, gas mark 5. Line the tart base with basil leaves. Place torn chunks of mozzarella directly on to the basil. Sprinkle over finely grated cheddar and then top with cherry tomatoes. Reserve one egg, whisk the other five adding the black pepper. Pour the eggs into the tart. Roll out the remaining pastry and cut out small shapes to edge the tart. I used a oak leaf cutter which gives the edge of the quiche a frilly finish. Whisk the remaining egg and brush the underside of each cutout. Stick the pastry cutouts to the edge of the pastry case. You can create a single layer or add extra cutouts to create a layered effect. Brush the pastry edge with egg so that it turns golden when baked. Finally sprinkle a pinch of sea salt over the top. 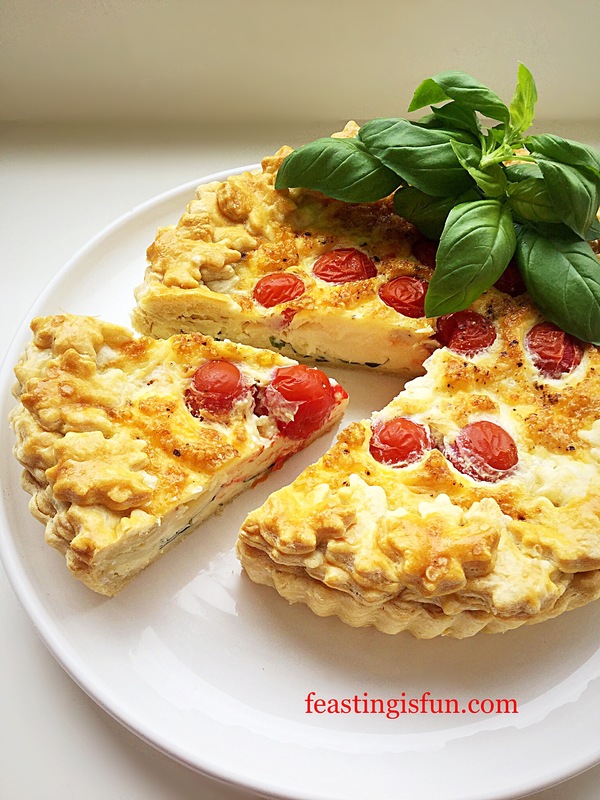 Carefully place the filled quiche into the centre of the oven – remember to check that the heat has been reduced. Bake for 40-45 minutes. 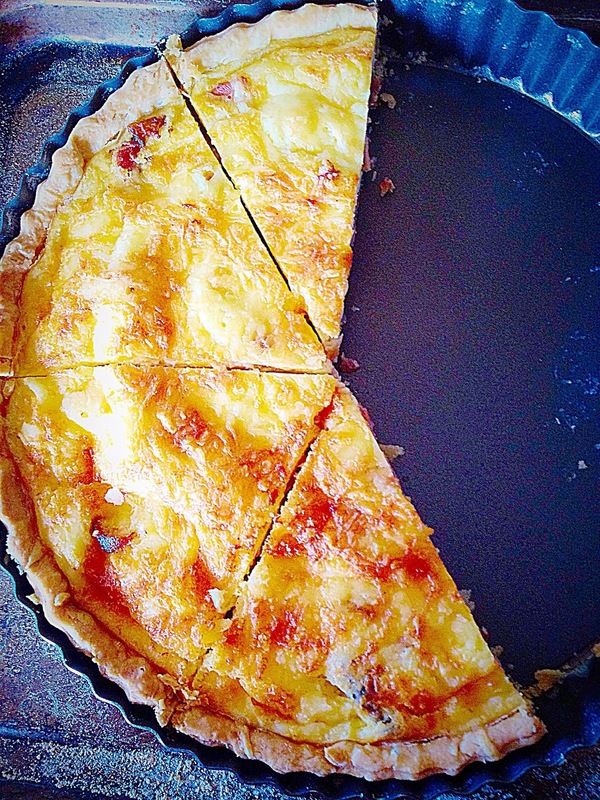 The quiche is baked when it is a golden colour and there is no wobble in the centre. As soon as the quiche is baked remove from the oven. Place on a cooling rack for at least 30 minutes before removing from the tin. Take care as the tomatoes will be very hot and juicy. The beauty of this quiche is that it can be served warm, at room temperature or cold, straight from the fridge! Because this quiche does not contain meat it is also suitable for vegetarians. Since I have made this twice it really holds it’s shape well when cold and would be perfect for taking on picnics. 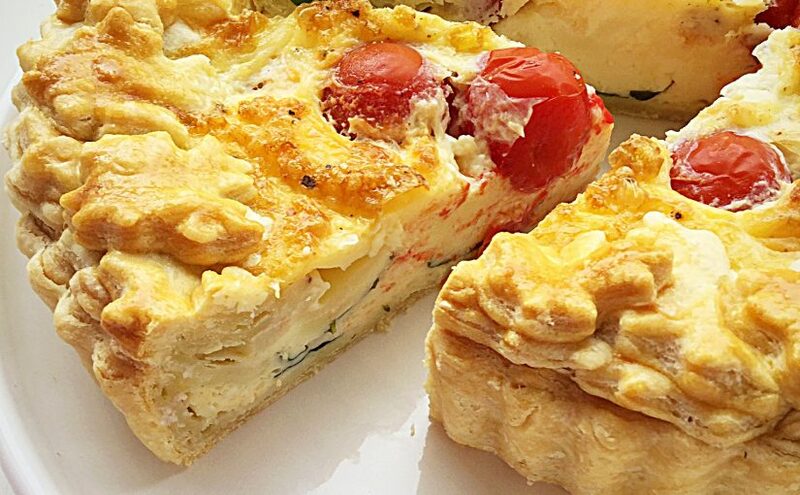 Most of all, when you bake this quiche make sure you share it. Especially as it is so pretty and absolutely yummy! Make up to 2 days ahead, cool completely, double wrap in cling film and refrigerate. 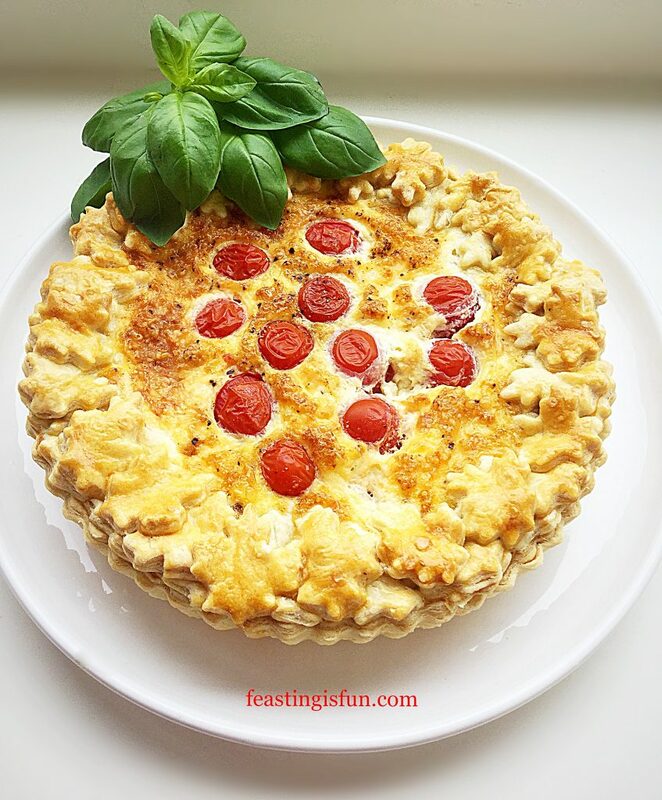 Due to the moisture content of the tomatoes I would not recommend freezing, unlike my Smoked Bacon Asparagus Quiche which freezes well. Although the pastry case can be made in advance and frozen. Quiche Lorraine, smoked bacon and cheddar cheese savoury tart. During this Summer, which I am hoping will be long and warm, I’m looking forward to creating recipes to share with you. Especially focusing on seasonal, local produce and products. Whether you live here, in Australia, Europe or the United States, I do feel that it’s important to support our local farmers. While some of you may get to visit farmers markets, if like me, it’s difficult for you to get out, take a look online. Since spending a little time researching I’ve found the equivalent of farmers markets online and they deliver! Most of all, if you remember one thing from this post – please keep your tomatoes out of the fridge, it kills their flavour! Whatever you are making, baking and creating in your kitchens, have fun preparing you feast. Also a huge thank you to everyone who follows me on social media and shares their creations with me.